Let's do a travel by the diverse cities and places of Azuero. 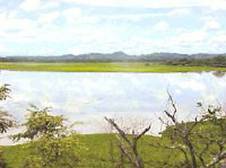 Famous district because of the Cienaga de las Macanas Nature Reserve, place of a great wetland where there are all kinds of birds, thus, it is favorable for the bird watching. In this district, the agriculture is one of the principal activities such as the cultivation of sugar cane and of rice. One of the rivers flowing through the Azuero Peninsula. On the other side is a rice plantation. Notice the amazing skyline that the mountains create. Just on the other side is the Pacific Ocean. The Azuero Peninsula has some of the most unique and amazing real estate in the World. Visit Panama and see the property yourself. Place full of history, customs and traditions. It is the place of one of the most famous carnivals of the Province of Herrera and of the making of masks of “diablicos” [evils], the conservation of the vernacular architecture of its dwellings, etc. 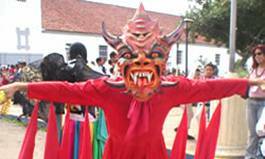 Parita on the Azuero Peninsula is famous for the devil masks. When you visit the Pacific Coast of Panama and the Azuero Peninsula you must see one these elaborate masks. Property in this area of Panama is a fantastic investment. Don’t miss out on the Real Estate Investment in Panama. Pese is known for their alcohol production. The Azuero Peninsula produces a large quantity of sugar cane that is distilled to make some great alcohol. Whenever on the Azuero Peninsula you have to stop and sample the Seco drinks or traditional Panama beer like Atlas or Balboa. This place is famous for the distiller activity of the cane juice. It is the house of the famous one "Seco Herrerano" alcoholic beverage elaborated from the fertilization of the sugar cane. They are places of legends, folklore, such as “Señiles”, who is a man that went out for hunting in Good Friday and was punished by God, taking care of the nature and to the animals of the hunters. It also has the extensive and most important forest reserve that Azuero still possesses. The Forest Reserve El Montuoso, where the prosperous La Villa river born, water reserve that supplies the cities of Chitre, La Villa de Los Santos, Guarare and Las Tablas. It is a population of craftsmen and craftswomen. They have discovered in the clay an industrious form to offer and to manufacture crafts. 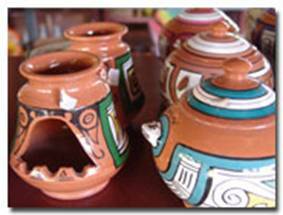 “Potes” [pots for plants], beautiful and bright figures with colors and native motives leave memories of the place. This place is very famous for its bread, smooth and fragrant smell and by the elaboration of the “diablicos” masks. This town belongs to the district of Los Pozos. Here is some of the amazing pottery down in the town of La Arena on the Azuero Peninsula. These beautiful pieces can be found in several towns along Panama’s Pacific Coast and Azuero Peninsula. When furnishing your recently purchased Panama beach house you can purchase these to add some true Panama culture to the ambience. Is the commercial and economic center of the Province of Herrera. Visiting the Cathedral San Juan Bautista is very recommendable, where you will appreciate a beautiful mural from the Passion of Christ, colorful stained-glass windows and marvelous altars carved in wood. Also, it is recommended to visit its museums where you will find a history review of the formation of the peninsula, also Chitre picturesque parks, an airport where you will reach to the peninsula from Panama city, only in 45 minutes of flight. Chitre is the economic center of the Province of Herrera on the Azuero Peninsula. Chitre is one of the largest cities on the Azeuro Peninsula. Chitre is about 30 minutes from Las Tablas, and an hour from Pedasi. 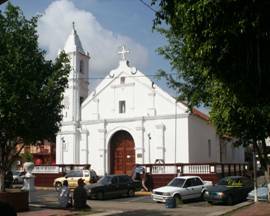 Chitre has beautiful old world churches and Cathedrals. 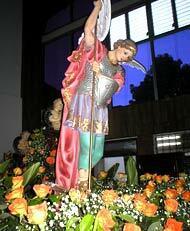 Is famous for its good-humoured people, its white cheeses and the festivities in honor of San Miguel Arcangel. Land of important exponents of the Panamanian folklore and culture. Here is a picture of San Miguel Archangel. Panama has a rich culture and the Azuero Peninsula is focus point of this culture. When buying land on Panama’a Azuero Peninsula you are getting more than just real estate, you are getting a gateway to one of the World’s most energetic and loving cultures. When you visit towns like Pocri and Pedasi its more than the breathtaking beach front property you are buying, you are purchasing a piece of culture too. Place of the famous Cerro Juan Diaz, where important archaeological excavations are carried out that will help to understand better, the pre-Colombian civilizations, how they moved through the Gulf of Panama trading with other tribes. La Villa , is one of the few towns where the vernacular architecture of their dwellings is conserved. It is recommended to visit the The Church of San Atanasio, where you will find beautiful and interesting altars carved in wood. 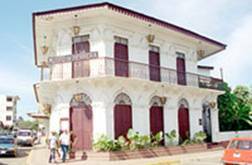 Besides, its historic Museum of La Nacionalidad[The Nationality] can be visited, where you will appreciate histories of the formation of the Panamanian nation, typical utensils of the area, etc. This district is headquarters of some of the most important fairs of the American Continent, the "International Fair of Azuero", which is a commercial, tourist, cultural, agricultural, and craft fair, where national and international exhibitors visit it to sell their crafts. This fair is concurred for more than 250,000 people each year. Watching a cultural event on the Azuero Peninsula. Panama embraces its cultural heritage like all countries should. Every person who visits Panama and the Azuero Peninsula become captivated by its serenity, beautiful landscape, and friendly people. Contact www.PanamaVacationRealEstate.com for all your real estate needs on Panama’s Azuero Peninsula. It is the land of the famous Festival of La Mejorana, the making of the beautiful “polleras” and beautiful arts and crafts made with wood; it is also the land of the famous fireworks, which are used for the carnivals and festive activities of all the country. It is a land of the famous and gloomy “Salto del Pilón” and also the boxing world hero, Roberto "Mano de Piedra” [Hand of Stone] Duran. Here is a traditional dress being worn during Carnival in the Azuero Peninsula town of Guarare. Guarare is only 5 minutes from Las Tablas and boasts some fine dining and rich culture activites. When you come to Panama you are exposed to many different culture events, there is something for everybody. But if you wish to relax on the many beach front properties available in the area that can be easily arranged. This is the land of the most famous and luxurious carnivals of the country; the making of beautiful “polleras”, “camisillas”, drums. Besides, this is the land of the famous illustrious one Dr. Belisario Porras, which was three times president and the most prominent republican figure of Panama, also is home of illustrious and important persons in the history of the country, such as: Mr. Moises Espino, Gerardino De León, Mr. Sergio Gonzales Ruiz, etc. In Las Tablas, is recommendable to visit the museum of Dr. Belisario Porras, El Pusilipo (country house of Dr. Porras), the Church of Santa Librada, the school Belisario Porras among others places. One of the timeless churches in Las Tablas. Another reason to visit the Azuero Peninsula is the historic buildings and Architecture. Panama takes great pride in its history and culture and tries to maintain them in this modern world. Las Tablas is the epicenter for Carnival. The town gets thousands of visitors to gaze upon the floats and party in the streets. Visit the Azuero Peninsula during Carnival and you won’t be disappointed. They are fishing towns, of beautiful beaches where the traditional agriculture and livestock are practiced. Pocri is home of the famous Holy Week in Purio, for that epoch, people go to the beaches, they build ranchos and cook delicious plates of shellfish and compete which one of the ranchos do the most delicious kitchen. Pedasi is home of the First female President that Panama ever had, "Mrs. Mireya Moscoso", land of the heavenly Iguana Island, Venao Beach, Punta Mala Beach, etc..
Pocri and Pedasi are the gems of the Azuero Peninsula. These little fishing villages capture the true essence of culture in Panama. Both these towns have fantastic beaches for swimming, surfing and fishing. Nicknamed the Tuna Coast the Azuero Peninsula has World Class fishing year round. Prime Beach Front Real Estate in Pedasi and Pocri are fantastic investment opportunities. Contact www.panamafishing.net or www.pedasifishing.com to setup a fishing trip on the Azuero Peninsula. Island of many traditions and folklore. From that place, famous typical groups have born which have traveled abroad to represent Panama out of the country. It is one of the few populations where still conserve their vernacular typical architecture of the place, houses built with woods. Carnivals are carried out there, where still dominates all in traditional and folk form. Tonosi is home of the Heavenly Isla de cañas, where spawn great quantity and variety of marine turtles, and also you can pass an echo-adventure in the Cerro Hoya Nature Reserve, where still there are a great variety of animals such as Tapir, Anteater, “Zaino” [wild pig], “Conejo Pintado” [kind of rabbit with spots], Jaguar, Deer, Pumas, etc; this region is dedicated to the practice of the agriculture, livestock, and fishing. Tonosi is one of the regions that produce big quantities of milks and good quality of rice. 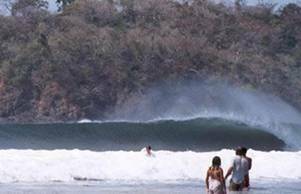 Tonosi is located on the Azuero Peninsula just a short drive from Pedasi. Tonosi offers amazing beaches and real estate investment chances. Fishing charters from www.Pedasifishing.com and www.Panamafishing.net are available. Come check out all the available beach front real estate on the Azuero Peninsula. It is a cattle raiser and agricultural region. It is known for the famous festivity of The Three Wise Men, which is carried out in the month of January and the festivity of “ La Semana del Campesino” [The Week of the Countrymen]. You can not leave without visiting the “Balneario La Taguara”, where is visited for great quantity of people during the epoch of the summer period. 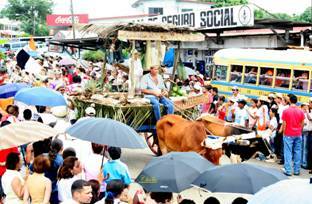 This is a picture of the country festival taking place in Macaracas on the Azuero Peninsula. 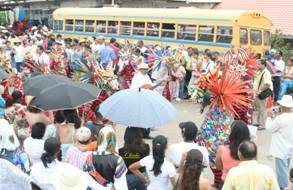 Words cannot describe the rich culture events that take place all along Panama’s Azuero Peninsula. There are great cultural events, spectacular beaches, world class fishing and Real Estate investment opportunities.